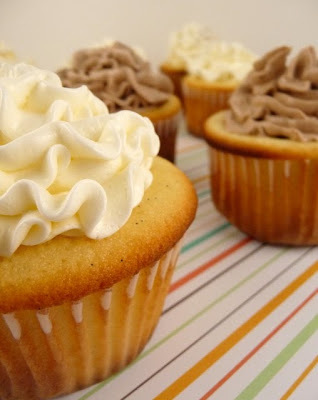 Do you want to taste the best vanilla cupcakes imaginable? 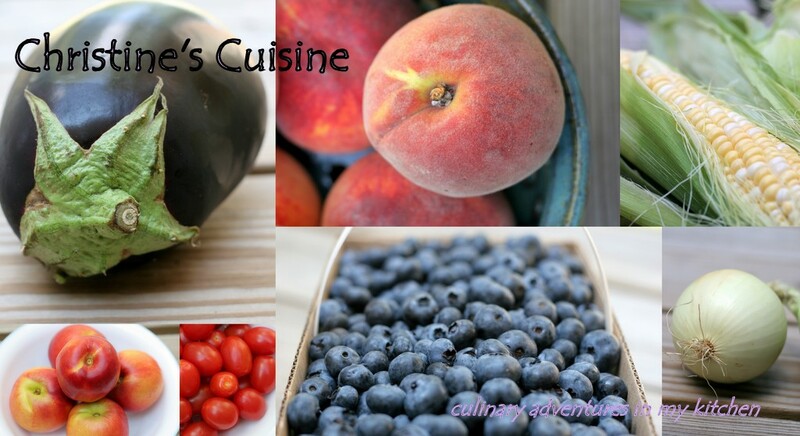 Did I hear you say - Yes – well try this recipe, all of your expectations will be met. The addition of the real vanilla bean, buttermilk and 5 eggs in the batter – make this flavorful, light, fluffy cake. I cannot wait to try this in the form of a layer cake. 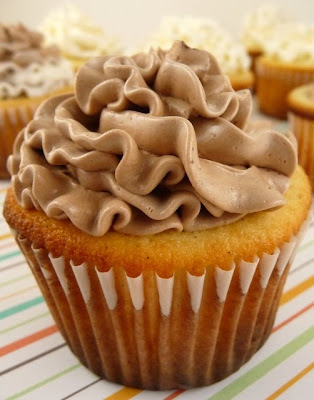 And of course, I top them with my standard favorite swiss meringue buttercream recipe (fold in some cooled, melted chocolate to make it chocolate). 1. 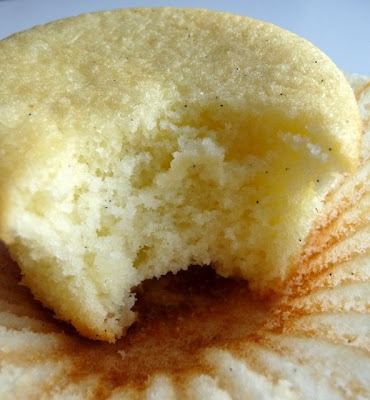 Preheat the oven to 350 degrees F. Line three cupcake pans with paper liners. Set aside. 2. In a medium mixing bowl, combine the cake flour, baking powder and salt. Whisk together and set aside. 3. Add the butter to the bowl of an electric mixer fitted with the paddle attachment (I have this and I LOVE it). Scrape the vanilla bean seeds into the bowl of the mixer with the butter and discard the pod. 4. Beat on medium-high speed for 3 minutes, until light and creamy in color. Scrape down the sides of the bowl and beat for one more minute. 5. Add the sugar to the butter mixture, 1/4 cup at a time, beating 1 minute after each addition. 6. Mix in the eggs one at a time until incorporated. Scrape down the sides of the bowl after each addition. 7. Combine the buttermilk and the vanilla extract in a liquid measuring cup. 8. With the mixer on low speed, add the dry ingredients alternately with the wet ingredients, beginning and ending with the dry ingredients and mixing just until incorporated. Scrape down the sides of the bowl and mix for 15 seconds longer. 9. Divide the batter between the prepared paper liners, filling each about 2/3 of the way full. 10. Bake 18-22 minutes, or until a toothpick inserted in the center comes out clean. Allow to cool in the pans 5-10 minutes, then transfer to a cooling rack to cool completely. These look yummy, I am going to make this for sure. Thanks for sharing. So pretty and ladylike! I've been wondering what to do with some vanilla beans a friend bought me. They make me think of a tea party! Yum!!! Do you mind telling me what tip you used to frost these?? They are beautiful! and I use the large star tip that comes with it - there is no size on it. 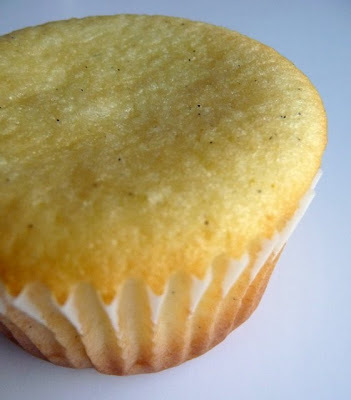 Do you use the sifting method for the cake flour? I'm not sure what you mean by 'sifting method' but you can definitely sift your flour in this recipe if you want to. To use cake flour you're supposed to measure the amount you need, sift it, measure the amount you need from what you just sifted, then sift again. If you don't dothis you will have extra flour than you need. However, some recipes were invented without this process. I'm making these today and not every recipe mentions if you're supposed to use the sifting method or not. Thank you! They look scrumptious!